Home / Reviews / Beauty and the Beast (2017) Blu-ray Review! I hear there was a tale… A tale as old as… TIME! I know, you may have heard this one before, perhaps it was the animated classic, or the stage production or the various other Disney versions, but now you get to hear it told again in live action form. Disney has been on a roll taking their classic properties and turning them into live action fantasy films. With the success of Maleficent, 101 Dalmatians and Cinderella, it was no wonder that Beauty and the Beast would be given the live action treatment. 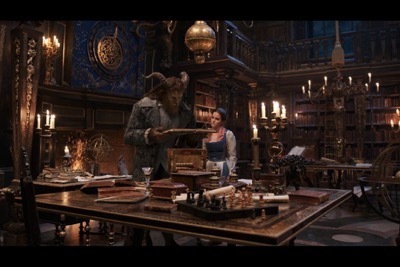 Beauty and the Beast, out today on Blu-ray, tells a tale… Wait, I did that already. It tells the story of Belle (Emma Watson) who lives in a quiet French village with her father Maurice (Kevin Kline). Belle marches to the beat of her own drummer, she would rather have her nose in a book than swoon over the towns most eligible bachelor Gaston (Luke Evans). Belle is independent and headstrong, which is why Gaston tries to woo her since she’s the only one who doesn’t leap at his advances. On one fateful day, Maurice leaves town and only his horse returns. 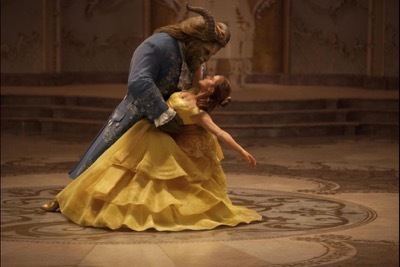 Belle goes after him and quickly realizes that he’s been taken prisoner by The Beast (Dan Stevens), a repulsive and hairy creature with a short temper and a fierce bite. In his house, his only “friends” are the living furniture and utensils that take care of the abode. Belle agrees to take her father’s place as prisoner if he is let free, the Beast agrees and Belle goes to live with him. This is where Belle learns of the curse that has befallen the house, The Beast only has a short amount to time before the curse is everlasting and he can only break the spell by falling love and being loved in return. Not an easy feat when you’re hairy, cranky and have no manners. In this version, the film is set in France rather than the more colorful world of the animated film. It’s interesting that when I initially sat down to watch the 2017 version, this change actually made the film a little more resonant and smartly moved the action in a more realistic direction. Most of the scenes are slavishly close to the original film, which works for the most part. There’s an expanded opening where Dan Stevens turns into the Beast, the backstory of Belle’s mother and a few other additions that I thought really helped flesh the story out as well. Particularly, Belle’s mother’s story, it really gave Emma Watson a lot of play off of and it made Belle’s decisions all the more meaningful. 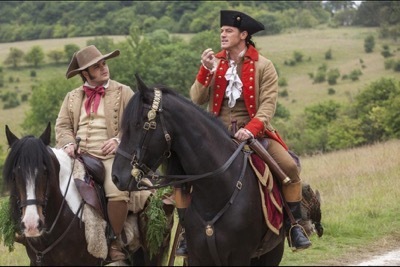 The actors really sell the film, in particular Luke Evans as Gaston. 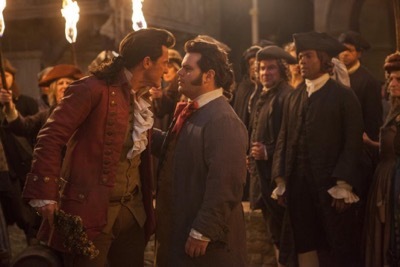 He really takes Gaston and makes him the standout in the film. It’s a career defining performance and one that should get him noticed where his more subtle (but equally great) work has been overlooked in films like The Hobbit. 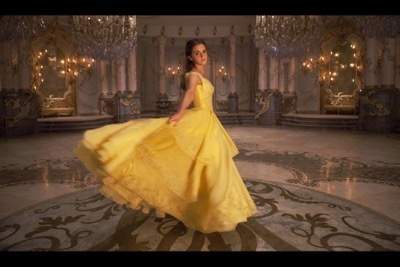 Emma Watson is good as Belle and something really shifts about midway through the film. Something clicks in her performance and she really fits into the characters shoes perfectly, which isn’t an easy feat. Beauty and the Beast arrives on Blu-ray in a stunning transfer thanks to the Walt Disney Studios. It’s pretty much flawless picture quality and if you don’t have high definition, this is a film worth getting it for! There is amazing depth of picture and the fine details are crisp and clear. It’s really wondrous and in this case especially the picture quality really brings the movie alive in a way I don’t think it would have on standard definition. A Beauty of a Tale – This is a behind the scenes doc that takes a look into the process of shooting the elaborate scenes and takes a look at the sets as well. It also looks into the motion capture technology needed. The Women Behind Beauty and the Beast – This is look not only in casting Emma Watson but also the fact that all the department heads on the project were female and their influence on the production. Enchanted Table Read – This is a look at the typical table read but this one includes singing, dancing and more. A fun featurette. From Song to Screen: Making the Musical Sequences – This featurette solely focuses on the musical numbers of the film. Extended Song – This is a look at Days in the Sun and has an introduction by Bill Condon. Deleted Scenes – This has just over six minutes of excised scenes. Making a Moment with Celine Dion – Celine Dion takes about her performance in the animated version and her decision about doing the live action film as well. 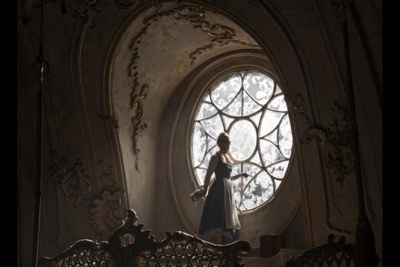 Beauty and Beast Music Video – This is the video with John Legend and Ariana Grande. 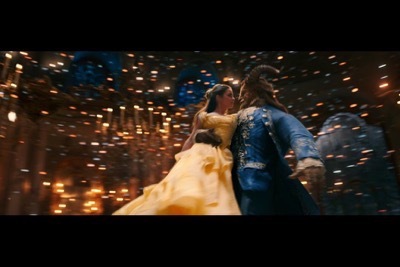 Making the Music Video – This is a quick look at the Beauty and Beast video. Disney Song Selection – These are Karaoke versions of some of the musical sequences in the film. Overall, I have to say, I really enjoyed this version of Beauty and the Beast. It’s so well done and a fine addition to the Disney cannon. The performances are excellent and the film looks amazing on high definition. The effects are stunning and the musical performances are jaw dropping at times. It’s a fun and awesome family classic. Beauty and the Beast is out now on Blu-ray! The Strain: The Complete Second Season Blu-ray Review!